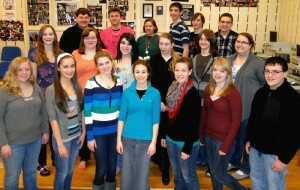 OSWEGO, NY – The All-County Chorus Festival was held in Fulton on April 1 and 2. Several Oswego High School students performed in the event. In front (left to right) are Rebecca Chatterton, Tara Stacy, Emily Hurlbutt, Alyssa Bornheimer, Julie Knight, Kaela Shafer and Justin Abbott. In the middle row are Cassandra Hondro, Katie Schermerhorn, Jane Coty, Jessica Reynolds, Duane Crasper and Rebecca Smith. In back are Cameron Caruso, Cody Crouse, Oswego High School music teacher Veronica Shaver, Josh Ewig, Steven Glenn and Alex Todd. Absent from the photo are Matthew Bunce, Samantha Davis and Tyler Rigby.